Unusually coloured hair and bizarre haircuts - your clients should see what your salon is capable of from the first sight. 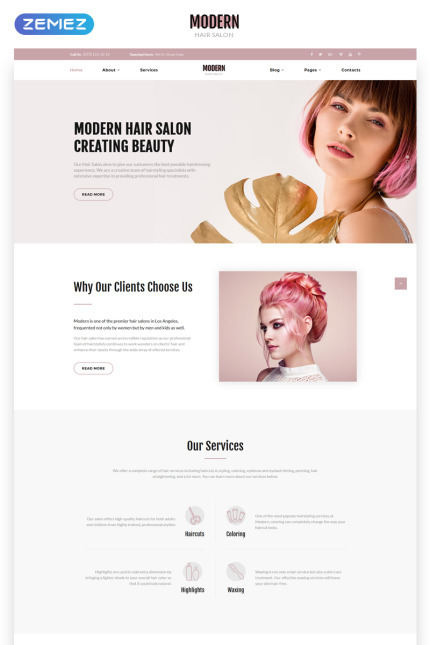 Modern multipage HTML template will help you to make a perfect first impression and make website random visitors your clients. The vivid slider on the top of the screen does the first strike. Gorgeous photos catch attention and show visitors your best works. Template structure is built to lead a client to the offers you can give him and make him love it. All the dynamic animation effects work smoothly and don't affect websites downloading speed. This template is beautiful, efficient and elegant - try it for yourself!